Logging out of Sweet Home, Ore.
Aaron Burke, owner of Bruce Burke Logging LLC, has a rock solid philosophy on how to stay successful in an ever-changing industry. Steve Will of Steve Wills Logging & Trucking says he wouldn’t be where he is today without family, employees and very special work relationships. Three Idaho operation owners share their experience and advice on when it’s time to fix up or trade up. Three Star Logging out of Crescent City, Calif., demonstrates that you don’t have to be big to be productive. 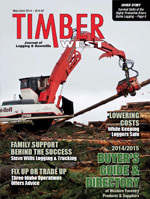 A look at the Washington State Loggers Safety Initiative. The Washington State University Extension reported that this summer, family forest landowners have two great opportunities: Washington State University Extension and DNR are co-sponsoring and hosting Forest Owner’s Field Days in eastern Washington on June 21 and in western Washington on July 26. The Forest Owner’s Field Day shows attendees how to develop a management plan for their woodlands and conduct activities that will help them reduce risks while protecting their financial investment. For more information contact WSU Extension Forester Andy Perleberg, at (509) 667-6540 or by email at andyp@wsu.edu. In the May issue of The Reporter, Eric Carleson, executive director of the American Loggers Council, linked the Fly-In and the Farm Bill. “ACL has been sending a delegation to Washington for many years, and in larger numbers in recent years. The ACL delegation is certainly part of the reason that something like the 2014 Farm Bill passed with votes from Republicans and Democrats alike, and was signed by the President. Because the delegation is led by the president and vice president of Associated California Loggers, the delegation will ultimately have each of these officers travelling to the nation’s capital for a total of four years (two years as vice president, followed by two years as president). This means that your ACL delegation always has experienced members, and it also means that many of the people in Washington, D.C. with whom they meet, know and remember the ACL officers who come back every year for four years. The delegation also brings in some new participants every year or two (a new vice president, for instance), and the experienced number of delegates grows. The Idaho Forest Products Commission has been busy talking to the community. Radio advertisements about forest sustainability and benefits for working forests hit the airwaves this spring. The IFPC introduced Forest Fast Breaks, a DVD with 14 animated videos that present information from clear cutting to carbon capture to wildlife and wood products. The videos are for classroom use. A new education poster “Look to the Forest” featuring artwork by Idaho artist Will Nelson shows Idaho’s forests from various points of view. The commission teamed with the Idaho Forest Group to distribute classroom reading sets of the book Why would Anyone Cut a Tree Down? to elementary schools throughout the state. The book was also sent to libraries.